What are you supposed to do when you are the most copied designer in the world? 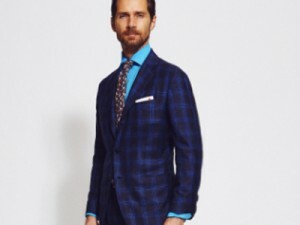 By now, every trip down any shopping street in the world – whether it’s New York, London, Berlin or Paris – will feature windows at the fast fashion chains which are full of cheap Gucci copies and even the mid-tier labels from Paris like Maje are shamelessly ripping off the embroidered Gucci butterflies and more. 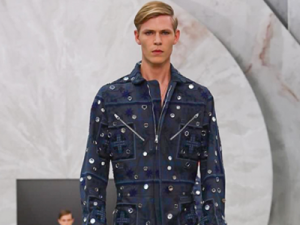 Well, Alessandro Michele said to himself: ”I have to question everything I have done so far. 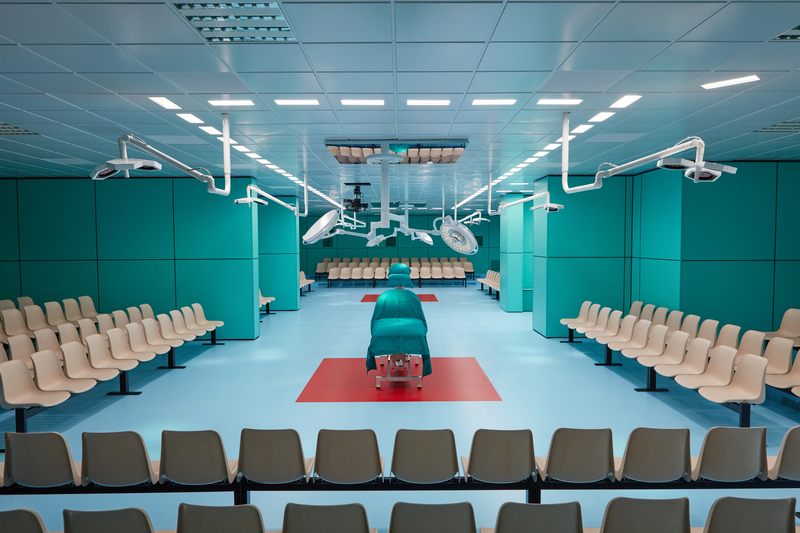 I put the surgery room set because this is how I feel at the moment. I have all these teams around me cutting and sewing and I am the one who decides.” So for this collection he went as far as performing emergency surgery on a brand that is going super well but because Michele is super smart, he understands this is not the moment to rest on his laurels but to keep on innovating and changing his formula to stay ahead. This time he was thinking about a Cyborg which technically speaking applies to an organism that has restored function or enhanced abilities due to the integration of some artificial component. 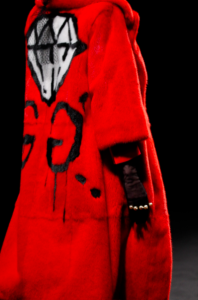 But in the deft hands of Michele fashion never feels artificial but whimsical and warm. He just loves his concepts and philosophical show notes, why not? But his message of love and inclusion comes through in his unusual casting where non-model types wear flapper dresses with crystal Tiaras. 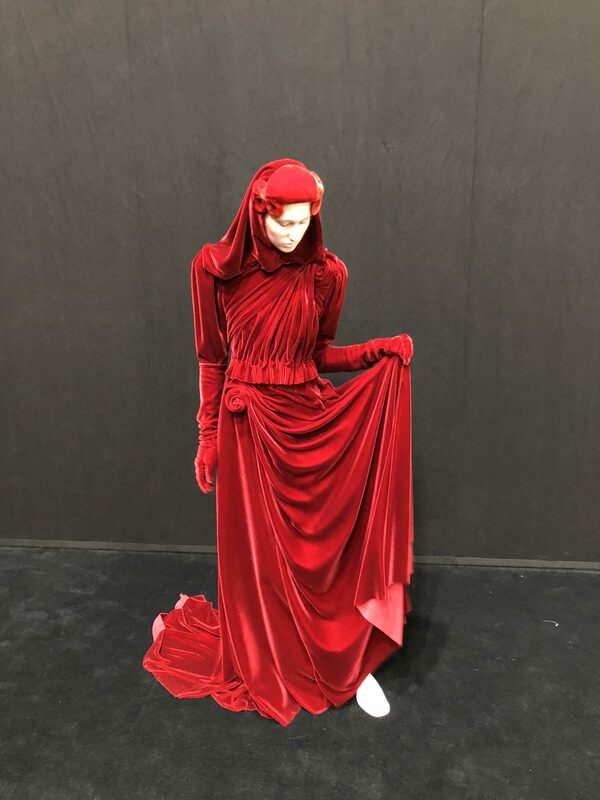 A knock out red velvet gown with headpiece and flowing train as worn by cool model Jay Wright from Iowa who even made it into Jason Wu’s swan song at Hugo Boss. She is exactly the kind of handpicked model which Michele loves as she looks slightly otherworldly and at the same time has such strong personality that she decides to become what she wants. Michele admitted that this was the hardest show to date as he feels he needs to reinvent himself and work even harder on each individual look. 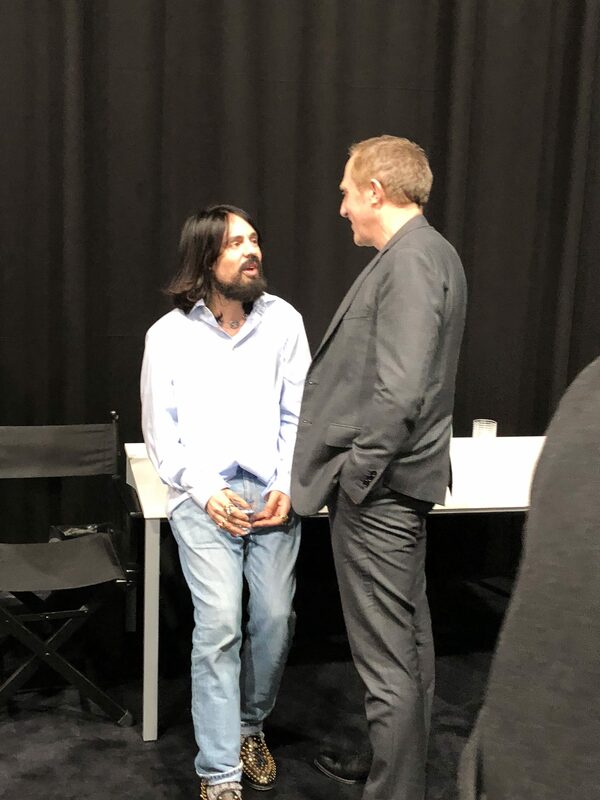 When you see a super relaxed designer quietly chatting away with his ultimate boss Francois Henri Pinault casually leaning against a table, you know that things are good in the house which also redoes its organizational structure with four new areas to keep ahead in the management game as well. 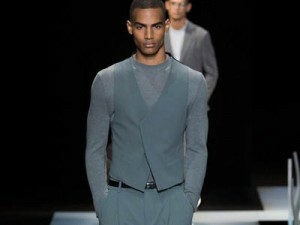 Milan as a city and as a fashion season has the unique talent to cotton on new things to the calendar. 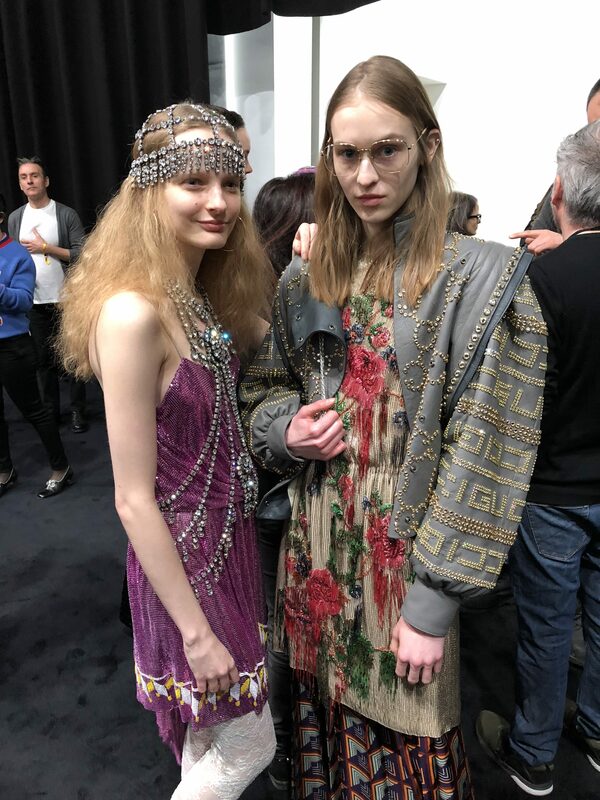 Recently, it’s been the Gucci show at 3pm, which started off the ceremonies, and editors and buyers flocked to Milan on early morning flights for that. Now Moncler has decided to bring everyone the night before to show off their new game plan working not only with two creators but eight. Interestingly enough, the name Karl Templer had disappeared from the Moncler line up as he is the latest name to be embroiled in the bad behavior towards models scandal. But we want to talk about our true passion here: the meeting of food and fashion which we call Achtung Appetit. And Karla Otto, the famous agency owner herself made people come to the Galleria Vittorio Emanuele II built by Giuseppe Mengoni and inaugurated in 1877 as “Milan’s Parlour” for a new project by one of Italy’s best chefs — and clearly the most handsome one — Carlo Cracco who is opening a new food emporium in the Galleria next to Prada and Louis Vuitton. Cracco has been in the Milan food firmament for many years now as he holds two stars from Michelin. Generally, it is very difficult for Italian chefs to get Michelin stars so two are considered a biggie in Milan. 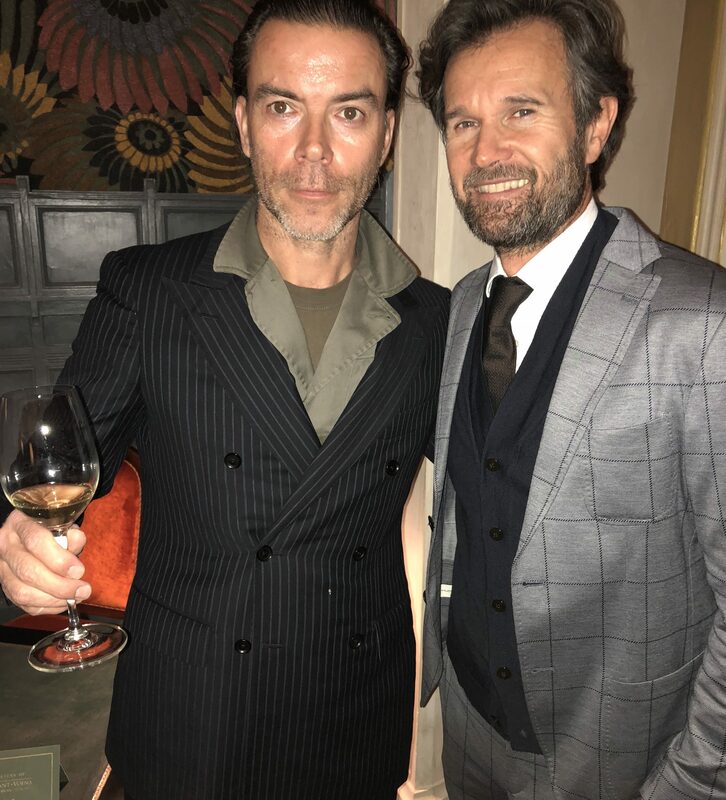 On top, it helps that Cracco is a super handsome man who likes to wear dandy suits as seen here with our editor wearing Etro. With this project he is also taking a serious stab to establish himself as a serious tastemaker as this project entails food, architecture, location and interior design. Why we say it’s smart? With Eataly giving the agri-culture Italy an international beacon of pride and a place to eat and source Italian ingredients something was missing at the high end of the scale. Well, Cracco is right there. How often do you get to hold such a 71 years old bottle of wine and taste it’s 12,000 Euro worthy ripeness? Beating out four other competitors for this amazing Galleria space right next to the original Prada store and inside Milan’s most landmark shopping district, Cracco has decided to bring his starred restaurant and a new concept café. 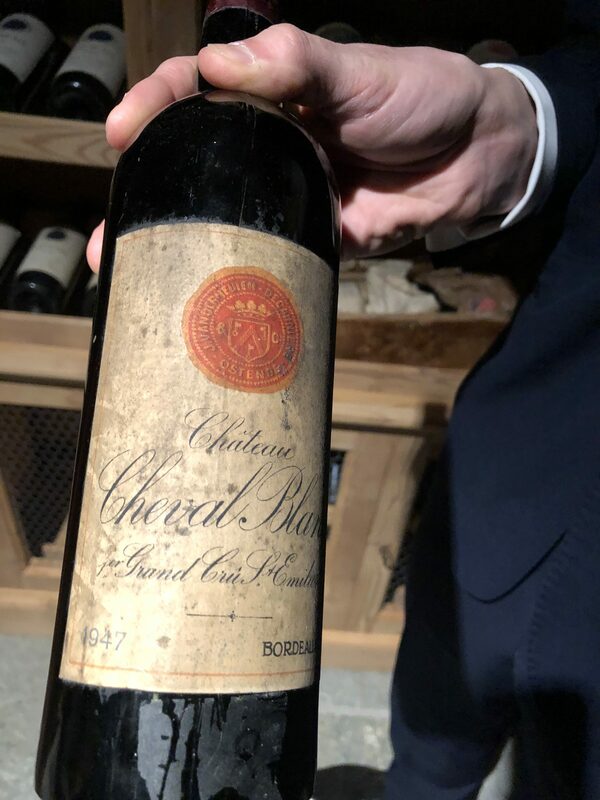 Going down to the basement to see the wine cellar was a true revelation with many Domaine de la Romanée-Conti wines and a 1947 Cheval Blanc which was bought at auction and will cost Euro 12,000. Carefully designed by architects Studio Peregalli to look like a high-end French restaurant with Italian eccentricies like Luigi Fontana Arte Povera pieces and handmade and custom designed Cracco plates by Richard Ginori, the place oozes dining elegance. 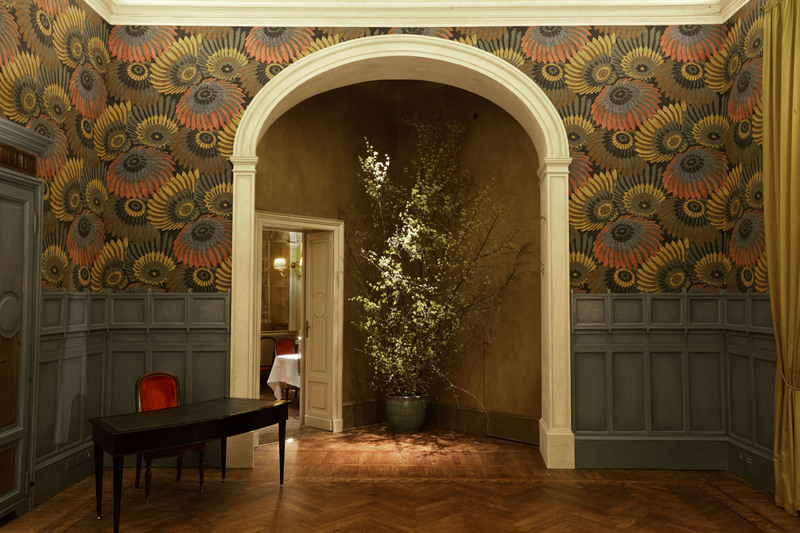 The welcoming area is featuring grey-sky blue boiserie and a large flower corolla hand painted wallpaper, which introduce the restaurant, cleverly divided into three rooms and two privé areas seating a total of 50 guests. Cracco classic dishes like the marinated yolk caramelized or cocoa crusted turbot and grilled bone marrow showing his passion for tradition and innovation. A separate menu includes oysters and caviar spaghetti. 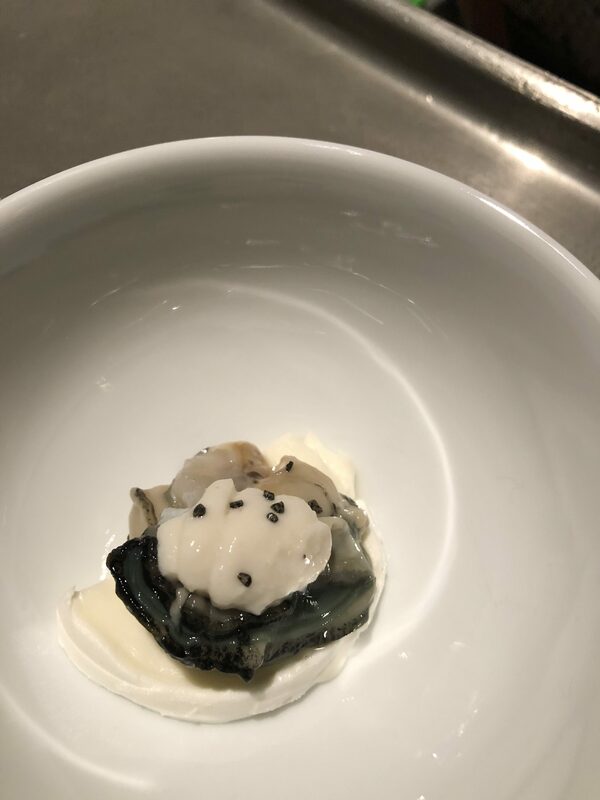 Cracco decided to lavish his guests with some of his signature hors d’oeuvres such as a Fine de Claire oyster from Bretagne with a pepper cream and a piece of Mozzarella di Buffalo and Himalayan salt.